I will be visiting Costa Rica and Guatemala in a few weeks with plans on completing the final production for this film and I am feeling really nervous about this phase. This time, I will be going alone without a translator and without a production team, but my apprehension mainly comes from the decisions I will need to make as director of this film. Finding the ‘truth’ in this documentary is much harder than I expected. I’ve felt pressure from all sides of the adoption community – pressure to protect adoptive families in the U.S. and pressure to protect the valid adoption industry. This recent article from The Surviors Foundation in Guatemala helped clear my mind of all the rhetoric and focus my thoughts on my initial purpose. The U.S. Department is continuing to ignore the human rights of mothers in Guatemala and the rights of their stolen children now living in the U.S. How will these children feel in 10-20 years when they realize the U.S. government was complicit with the corrupt adoption industry and kept them from their families in Guatemala? My loyalty stays with mothers and families of Latin America and all victims of this corrupt system. 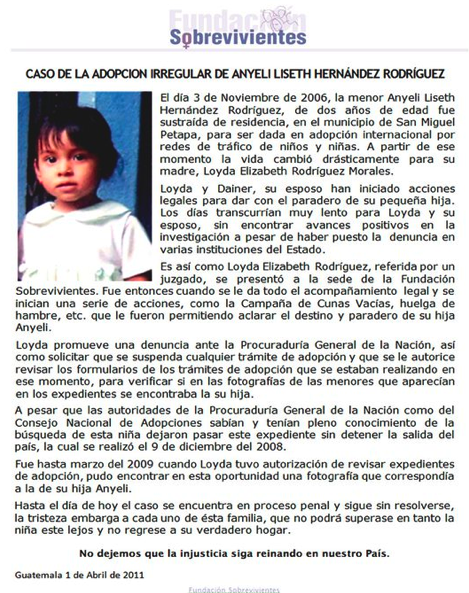 November 3, 2006, the lowest for Anyeli Lisette Hernández Rodríguez, two years old was stolen from residence in the municipality of San Miguel Petapa, to be given in international adoption networks trafficking children. From that moment, life changed drastically for her mother, Elizabeth Loyd Rodríguez Morales. Loyd promotes a complaint with the Attorney General’s Office and seek a stay any adoption process and to be allowed to review the forms of the adoption order being made at the time, to verify whether the photographs the children who appeared in the files was the daughter. Although the authorities of the Attorney General’s Office and the National Adoption Council knew and were well aware of the search for the girl they let this file without stop the departure, which was held on December 9, 2008. Until the day the case is criminal and remains unresolved, sadness engulfs each of this family, not to be exceeded while the child is away and not return to his true home. Unlikely.